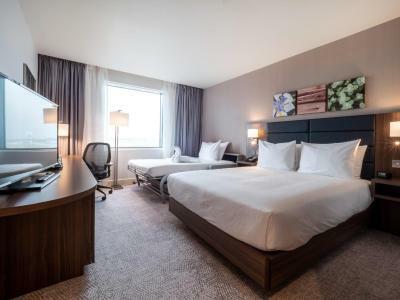 Lock in a great price for Hilton Garden Inn Birmingham Airport Uk – rated 9.1 by recent guests! I liked the waffle iron where you could make fresh waffles. Staff at reception was very helpful and room was excellent. The hotel is located literally across Birmingham airport. The rooms and bathrooms are really excellent at this hotel - well beyond my expectations. Excellent location and customer service. Rooms very clean and modern. Restaurant and bar on the ground floor. It is a new hotel so very modern and comfortable . We were attending Crufts so it was very convenient to the airport. we arrived very early and we were able to leave our bags at the reception. It was to early to check in so we popped back later to do that and get some bar food too. The room was a good size, beds were very comfortable and the bathroom was bright and fresh and new. Rooms were clean and spacious. Staff were friendly and very helpful. Gave me an early check in as my child was ill. Upset because of the rate change from March 8 to March 9. 79.00 to 199.00 is not justified!! A great priced hotel just a few minutes walk from the departures at the airport - meaning we could start our mini break a day early. The room and all of its facilities were great. There were comfortable chairs to relax in, the aircon was easy to use, the bed was comfortable and the soundproofing was fantastic! 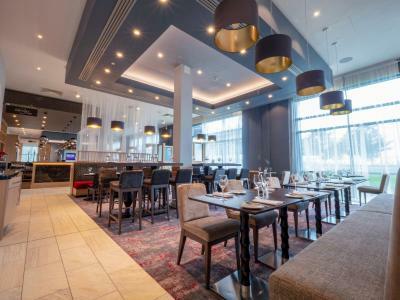 Hilton Garden Inn Birmingham Airport Uk in Bickenhill features a fitness center and a shared lounge. 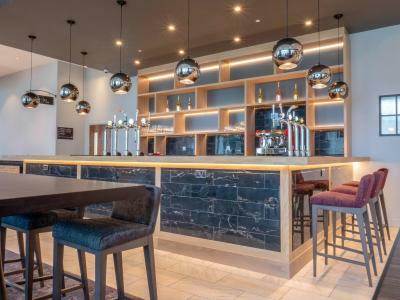 Offering a bar, the property is located within 2.5 miles of NEC Birmingham. Free WiFi is available. At the hotel, each room includes a desk. 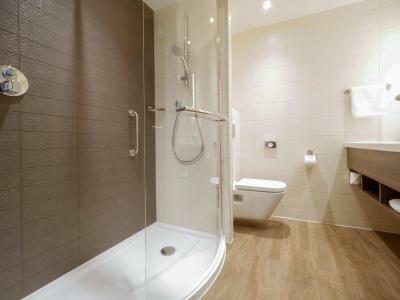 The rooms are equipped with a private bathroom with a bath or shower. 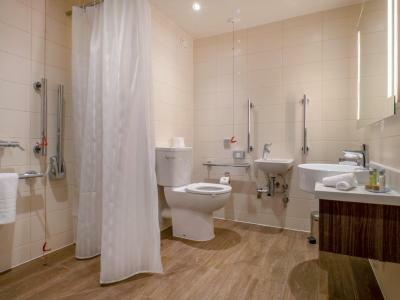 At Hilton Garden Inn Birmingham Airport Uk, every room is equipped with a seating area. Breakfast is available every morning, and includes buffet, Full English/Irish and vegetarian options. At the accommodation you'll find a restaurant serving European cuisine. Gluten-free, halal and vegetarian options can also be requested. 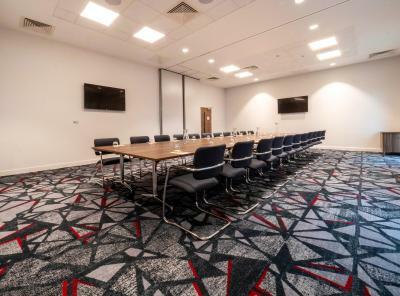 Other services and facilities offered at Hilton Garden Inn Birmingham Airport Uk include a business center, newspapers and a fax machine and photocopier. Staff at the 24-hour front desk can lend a hand with guidance about the area. Genting Arena is 2.4 miles from the hotel. 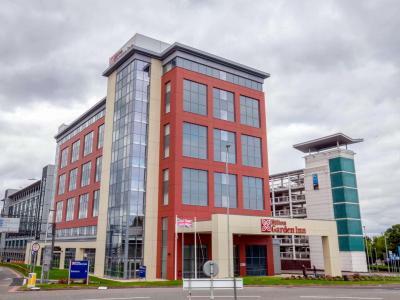 The nearest airport is Birmingham Airport, a few steps from Hilton Garden Inn Birmingham Airport Uk. This property also has one of the top-rated locations in Bickenhill! Guests are happier about it compared to other properties in the area. This property is also rated for the best value in Bickenhill! Guests are getting more for their money when compared to other properties in this city. 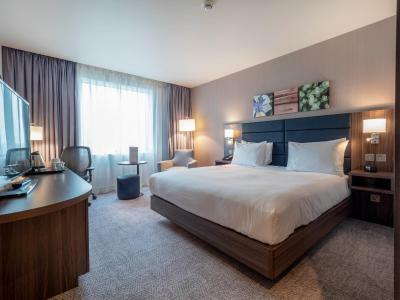 When would you like to stay at Hilton Garden Inn Birmingham Airport Uk? This double room has a sofa, seating area and cable TV. This double room features a tea/coffee maker, soundproofing and air conditioning. This family room has a soundproofing, seating area and air conditioning. 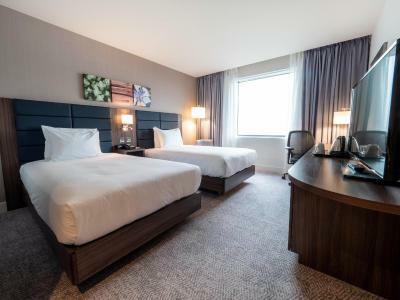 This twin room features air conditioning, seating area and satellite TV. 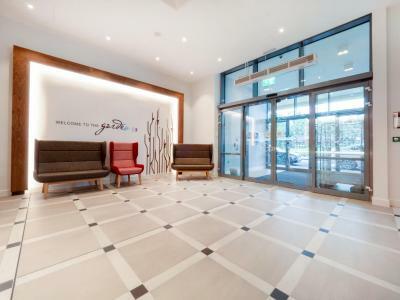 House Rules Hilton Garden Inn Birmingham Airport Uk takes special requests – add in the next step! All children under 12 years are charged GBP 20 per night for extra beds. Any additional older children or adults are charged GBP 50 per night for extra beds. Hilton Garden Inn Birmingham Airport Uk accepts these cards and reserves the right to temporarily hold an amount prior to arrival. Friendly reception staff, staff at bar and the restaurant equally as friendly and helpful. Room comfortable and clean. Beautiful hotel room with a lovely view of the planes. Very quite considering we were right on it’s door step! Lovely staff. Could do with a pool, plus some outdoor seating capacity, when the weather is hot! Everything was very simple and quick upon arrival all the staff were lovely and had amazing personalities! 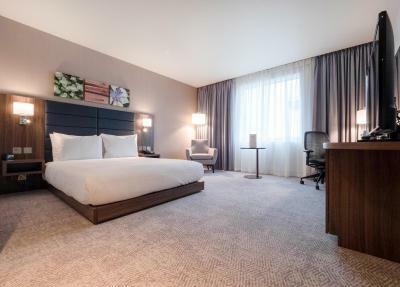 This hotel is brilliant for anyone having an early flight, you are two minutes walk to the airport. Good location, everything was clean. Everything was perfect, friendly and professional, immaculate, well designed. quiet,comfortable, welcoming!Everything worked well. The lighting was great! Details details details, it all felt luxurious. The public areas were inviting. "The Shop" was a nice touch. Excellent breakfast buffet. Right across from the airport. I walked. The location was incredible, only a 2 minute walk across to the terminal the morning of our flight. The hotel itself was very nice and had a lot of amenities that we needed including an iron and hairdryer. The restaurant was nice as well and the staff very good. The bar began closing at 10pm on a Saturday night. I felt rushed to drink up. I had been travelling all day. Needed beer and food. Ended up with a sandwich from the airport and beer in my room. No atmosphere. Dreadful but room nice but music by the lift deafening. Charged me £1.20on my card for security. Location was excellent for the airport. Breakfast was good and fair value, as was dinner. Staff appeared efficient and dealt with all our needs.